Last year, we took a few photos of Nolan and Ephraim in their matching Christmas jammies in front of our tree. 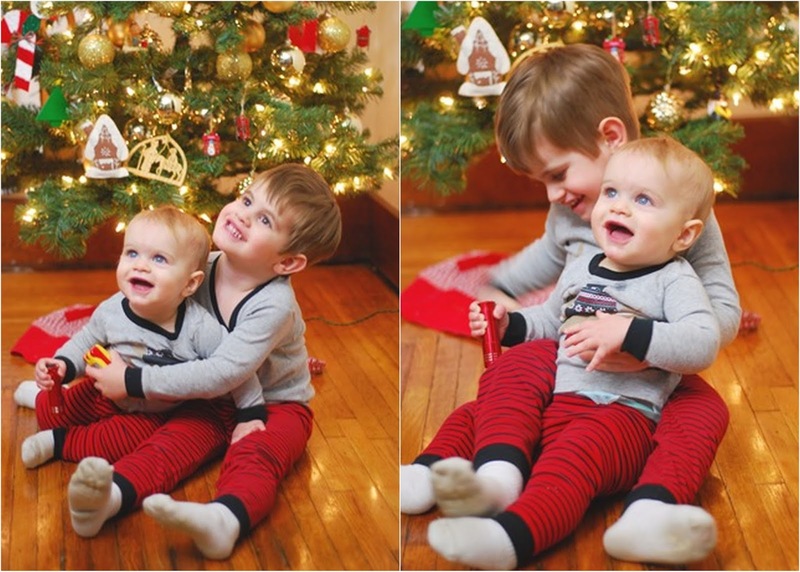 The photos were so adorable, and my heart swelled so much that I knew it had to become a Zimm tradition :) In early November, I started searching for cute Christmas PJs, and I found these penguin "Santa's Helper" white shirts and striped red pants from Carter's. They were perfect! I am always scavenging for a great deal. . . Somehow, I was able to get both sets for $5 total. . . including shipping! Miss Ivy tried to sneak into a photo. Ephraim is ready for his second Christmas! And Nolan. . . his 5th! Here was their first annual matching jammies photo. They've grown so much! These are the sweetest pictures Rachel! Your boys are too cute :). Oh my goodness!!! So so precious!!! Kids in matching Christmas jammies make my heart melt! Your boys are adorable...so happy and giggly! Also I am obsessed with these pajamas because penguins are my favorite! So cute. Those sweet boys!! I love a good set of PJ's! !